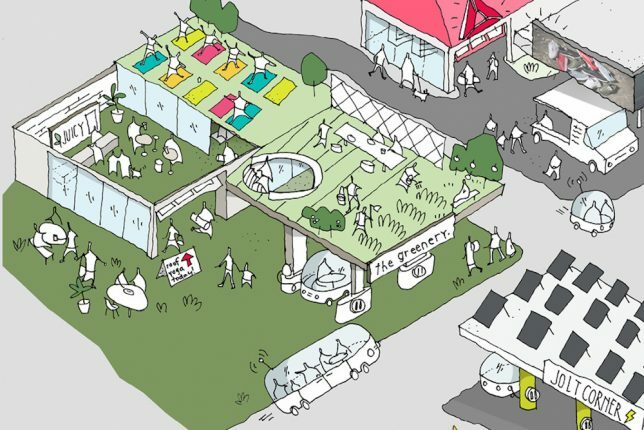 Could the Useless Gas Stations of the Future be Used as Gyms Instead? The electric vehicle revolution is accelerating faster than anyone expected, with many experts predicting at least 100 million electric cars hitting the roads by 2035 – making up 85% of new car sales. That’s less than two decades away. Cheaper battery costs are set to make these cars far more affordable for the average person, so before long, they’ll be a lot more enticing to consumers than gas guzzlers that cost much more to run. That, of course, could leave us with a whole lot of empty gas stations. There are currently about 150,000 of them in the U.S., a decline from the 1994 peak of 200,000. Within the blink of an eye, gas stations are going to seem as quaint and outdated as soda fountains and VCRs, more curiosities than anything else. But that doesn’t mean we have to knock them all down. 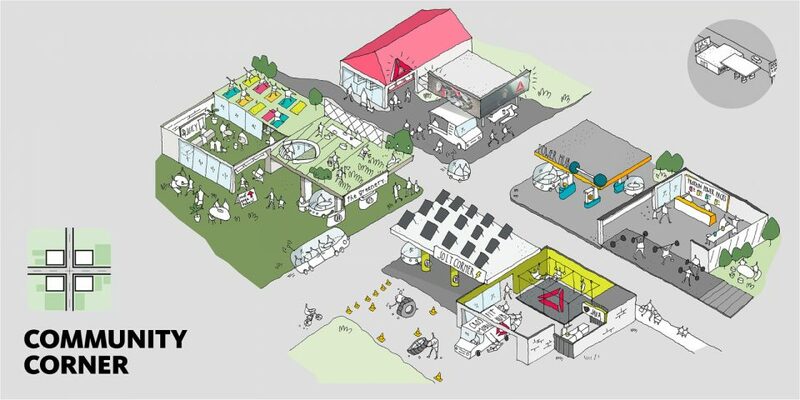 Many of the buildings could be reused almost as-is, and research firm Gensler has teamed up with Reebok to envision what that might look like. 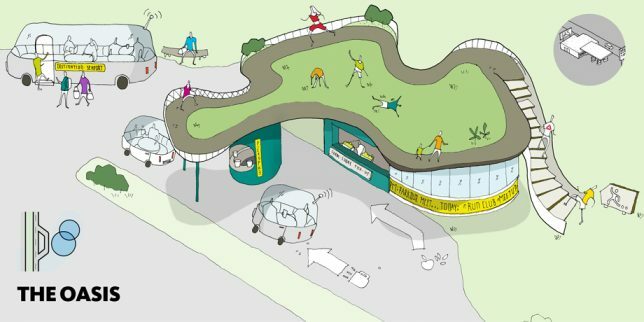 Their ‘Get Pumped’ partnership repurposes the gas stations of the year 2030 as community fitness hubs, giving them green roofs, walking paths and workout equipment. First of all, they explain, gas stations are usually centrally located, and the ones located alongside major highways could become dual electric car charging stations and gyms. Reebok calls them “the power grid of the future.” Some are set up as networks surrounding highway interchanges where multiple stations are usually located. ‘The Oasis’ transforms a larger station into a nutrition center with juice bars, farm-to-table restaurants, yoga and meditation. 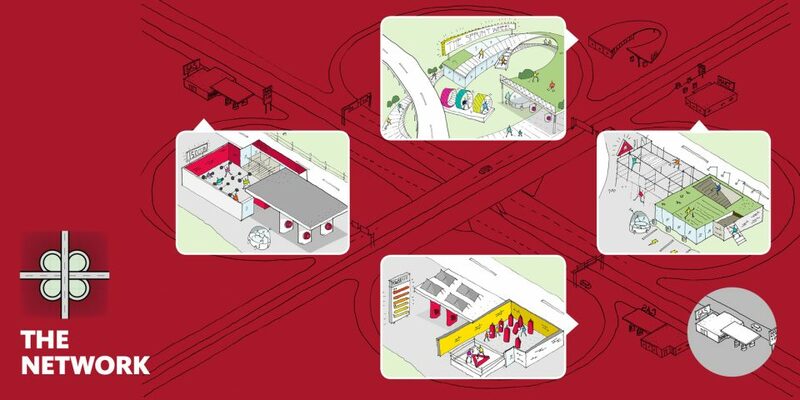 At ‘The Community Center,’ smaller local gas stations become hubs for car charging, nutrition classes, an auto repair shop, a minimart and popup workout centers run out of trucks. “We envision our cities of the future to have a network of fitness oases between home and work where you could stop and recharge more than just your car. Imagine an option to leave the traffic jam to unwind with yoga, get your Crossfit Fix, or pick up a green juice and your weekly farm share all in one place!” said Alfred Byun, designer at Gensler.